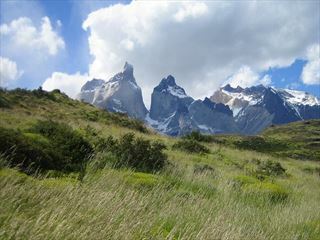 Experience the incredible, captivating scenery of Patagonia, one of the world’s most remote and beautiful environments. 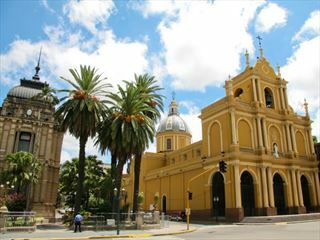 This 14-night adventure will create memories to last a lifetime, starting and in the passionate, vibrant capital of Buenos Aires, before heading to Chile to immerse in this striking region of towering mountains carpeted by vast, windswept plains, dramatic ice fields and spectacular glaciers. Trek to the awe-inspiring Laguna Torre, follow unbelievable glacier hiking trails, and visit quirky towns at the end of the world. 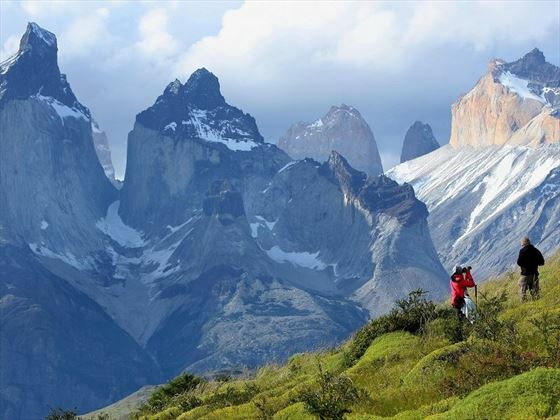 You’ll also have the opportunity to camp for three nights in the magnificent Torres del Paine National Park, soaking up the wonderful Patagonian scenery with numerous hikes and excursions. * There are multiple treks involved throughout this tour, some of which can be quite challenging – a good level of fitness is required to get the most out of this trip. Welcome to Argentina! Please ensure that you arrive by 3pm today, in time for your group introduction and meeting. In the afternoon, your Tour Leader will take you on a 2-hour orientation walk around some of the city’s main attractions, before heading out for an optional group dinner this evening. Today, you will fly from Buenos Aires to El Calafate (3hrs), and then travel by private van to the frontier town of El Chalten. 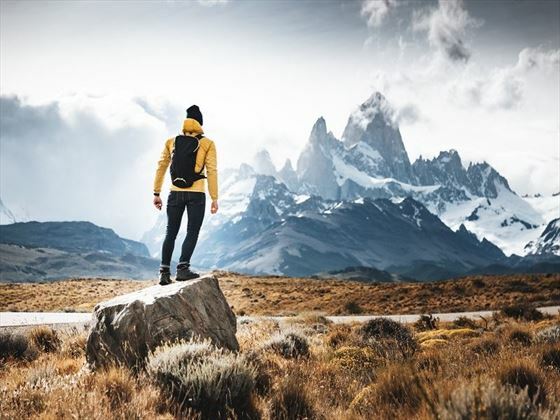 This outdoor-orientated region is known for its laid-back atmosphere, and is a popular destination with hikes and climbers from all around the world. Across the next two days, you will take on at least two of the most popular day-treks in the area: Laguna de los Tres and Laguna Torre – these hikes are rated moderate to difficult, and you can expect to walk from six to nine hours along clearly-marked and well-maintained pathways. Wind and rain may be the main challenges you’ll face on these walks, as the terrain itself isn’t difficult. You will complete whichever trek you didn’t tackle yesterday, whether it’s the Laguna de los Tres or Laguna Torre (weather depending) – both of which are spectacular and very rewarding. Enjoy breakfast and a morning at leisure in El Chalten, before transferring back to El Calafate. The rest of the day is at leisure. 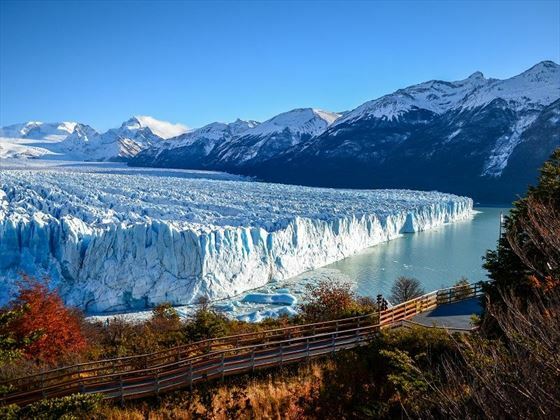 You will visit the magnificent Perito Moreno Glacier today, which is one of the few balanced glaciers left in the world at 1.8 miles wide and 21 miles long. A spectacular sight to behold, you will watch and listen to the crack of ice as it plunges into the deep waters below. After a day of exploration, you will return to El Calafate for the night. Please Note: The maximum age limit for today’s activity is 65 – the operator that runs this excursion will not make any exceptions. Those aged 64 and over will instead be able to walk along the platforms and balconies surrounding the glacier, taking in this magnificent site from a variety of angles. It’s a long day of travel today as you head from El Calafate to Torres del Paine. Early in the morning, hop on a local bus to Cerro Castillo, Chile (5hrs); On arrival, you’ll stop for lunch and wait for the connecting private van to Torres del Paine (1.5hrs). You’ll spend the next three nights in the park camping, sharing a tent with a fellow traveller. Please Note: Sleeping bags are not provided, so you’ll need to either bring your own, or hire one locally – please inform your tour leader on Day 1 if you intend to hire a sleeping bag. 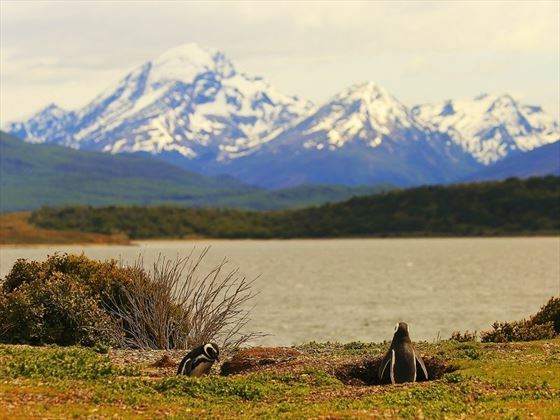 Sitting at the ends of the earth is the spectacular, iconic Chilean Patagonia, spanning over sparkling lakes, cascading waterfalls and striking mountain scenery, where guanacos, pink flamingos and nandues are bound to be seen. - The most popular trek in the area is known as ‘Base Las Torres’ (The Owner’s Base), and your leader will be able to recommend when to take this hike, depending on weather conditions. - Another hike is towards ‘Refugio Los Cuernos’ (The Horns’ Lodge). This hike is a long one, but offers amazing vistas across ‘The Horns’ section of the park. The treks are rated moderate to difficult, are clearly-marked and will range from 5-8 hours per day. 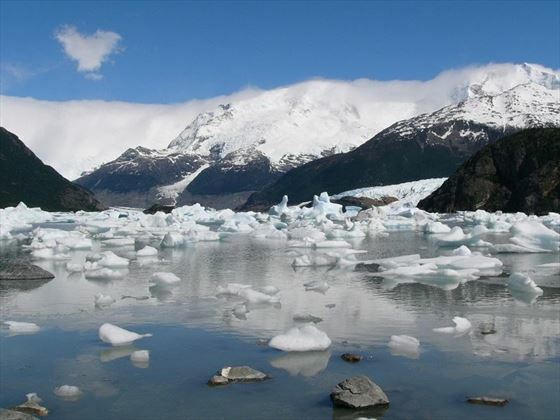 Weather in Patagonia is an important factor to consider, so you must be prepared for cold, wet and windy conditions. Today will be spent further exploring this extraordinary landscape, hiking the trails and treks that you missed yesterday. 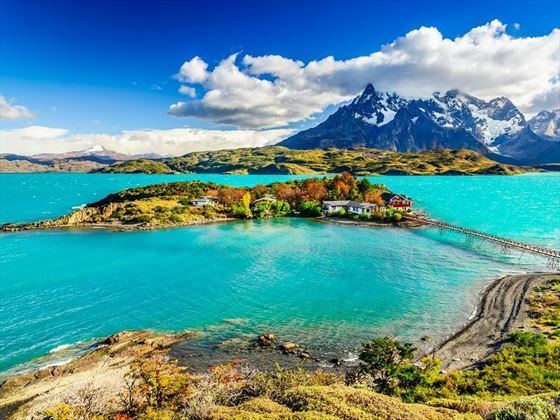 Today, you will be taken on a full-day guided tour around another part of Torres del Paine National Park, including a visit to the stunning Lake Grey. You’ll then transfer to Puerto Natales in the evening, taking around 3hrs, where you will spend the night. You’ll hit the road today for one last time, with a 14hr bus ride back to Ushuaia, Argentina (be sure to pack some on-board entertainment for the long journey!). 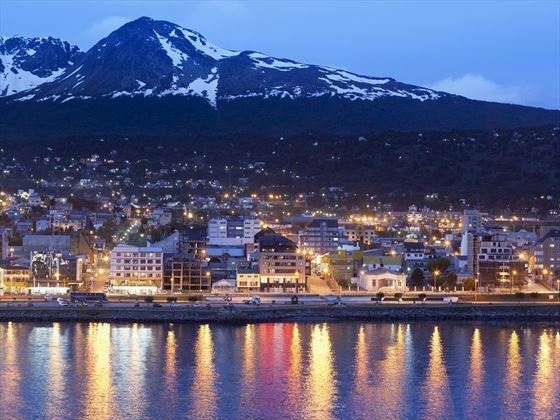 The southernmost city in the world, Ushuaia is the gateway to Tierra del Fuego National Park, the nation’s only coastal park. After breakfast this morning, you will take a picturesque boat trip on the Beagle Channel, a waterway named after Charles Darwin’s expedition ship – spend time soaking up the scenery and observing the abundant marine life among the small islands and inlets. 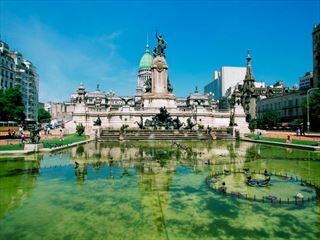 Today is completely free for you to explore this unique city, before returning to Buenos Aires tomorrow. 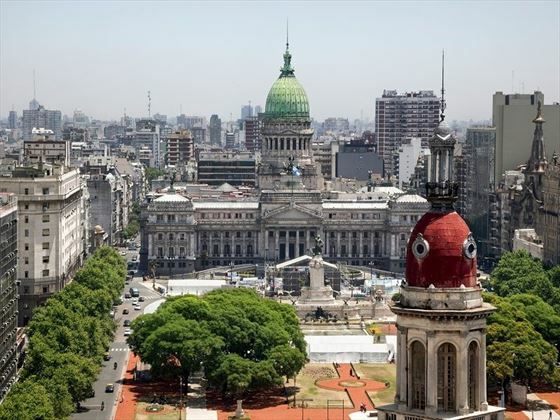 Return to Buenos Aires by plane for a final night out, staying in a centrally-located hotel to make the most of your time here. Please Note: Whilst it’s intended to return to Buenos Aires in the early hours of the afternoon, airline schedules in Argentina are known for changing without much notice, meaning that you could potentially arrive in Buenos Aires as late as 11pm tonight. As there are no activities planned for today, you are free to depart at any time.